After the “flood,” (terming it as “the flood” makes it sound a lot like the Old Testament, Noah and the Ark event), the hubby and I are pretty much surprised about the things in the house that survived. We have expected things to be practically useless. One item that I am pleased that has survived that flood was my 5 year old Goodsphere. It is a revolutionary air purifier/ionizer system. We bought it when we were prego with our son. We were still renting this basement apartment in Makati that has bad ventilation (read:basement). We left a few months after and transferred to another apartment. This air revitalizing system helps clean the air and you actually see for yourself how the water gets darker as it does its job. Before the flood, I replace the water and clean the basin once a week, but during the cleaning up from the flood, it has to be cleaned once a day! I wasn’t expecting it to still work after I have cleaned the mud off of it. But lo and behold it did and I couldn’t be more grateful. The stench that the mud water has left was unbearable. 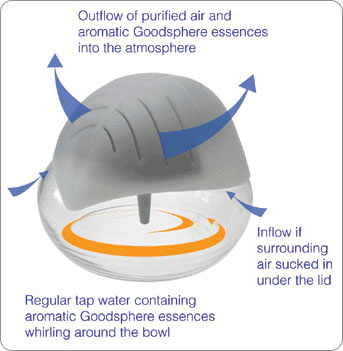 The Goodsphere ionizer helped the house smelled clean again. Of course, it also entailed some rigorous scrubbing with chlorine and lysol here and there. This is the one time that I so appreciated this air purifier/ionizer. The conversion of positive ions in the air into negative ions and the fact that its aromatherapy clears away the funky smell the flood has left without marking my walls is just neat (I love scented candles! ).